Have you driven a 2017 Subaru BRZ? Displaying all 3 2017 Subaru BRZ reviews. Change in suspension from previous models really lets the car hug roads even better. Leather and suede interior makes it feel like a more expensive car. Paddle shifters in the automatic are about as true as you can get; very little delay, doesnt baby you too much like some other paddle shifting automatics. Handling Ranked 2017 Toyota 86 Coupe worse. "Upgraded suspension and truck chaise really help." Family Car Ranked 2017 Toyota 86 Coupe better. "Rated this to be a more family friendly car than the BRZ simply because the price tag. The interior dash is plastic, so easier upkeep than the leather in the BRZ." CarGurus has 913 nationwide BRZ listings starting at $10,487. This car has a nice short throw. It is definitely a car for some one who is just learning stick. The car has decent power for everyday driving but this car excels at being driven hard threw curvy back roads. You can push this car and not worry about speeding tickets. I can definitely say in this car you will be smiling every time you drive. Front Seats Ranked 2018 Subaru WRX Premium worse. "The front seats in the brz are low and in the perfect driving position. Makes you feel like your in the cockpit of a race car. " Would Buy Ranked 2018 Subaru WRX Premium better. "The wrx is a car with many roles. It is a family sedan when you need it to be. It has the power and agility to be taken to the track. This is just an all around comfortable car that fits what you need when you need it." Decent power, with good gas mileage (uses premium), comfortable front seats, rear seats are minimal. Car is too small. Handles great. Manual shift is great. Handling Ranked 2017 Ford Mustang V6 worse. "Car is smaller, lighter, steering is light. Car sticks to road." 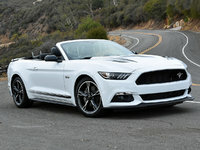 Family Car Ranked 2017 Ford Mustang V6 better. "Overall bigger size, especially rear seats. Easier entry and exit."